AK Build Class held in WARM and Sunny Phoenix, Arizona! AKM Parts Kits Are Available! 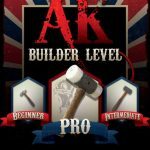 Building an AK or Combloc Style Rifle includes the precision and hand crafted art of Rivet Smashing. We will instruct each student on the technique in addition to barrel head space and population. Canted sights are the most irritating issue with most AK Style Rifles; Lee Armory students leave Phoenix Arizona with an understanding on how to remove this issue and or prevent it from happening depending on the students tools. Head spacing encompasses one of the most important tasks for the rifle to function safely; we emphasis this point and drive it home with our students preforming the work. In the event our students are interested in Cerakote, we can hold the rifle and send it out to We Plead the Second for Certified Cerakote Application. Cerakote provides a solid durable coating which is far superior to almost every other coating on the firearms market. We’ve tested Cerakote to 1000 rounds of continuous full auto machine gun fire with almost no issues. * California Residents Welcome! We will ship the rifle back to an FFL of your choosing for DROS. – Rifle must be Featureless per California DOJ. We recommend a Strike Industries AK Fin Grip for California . One day classes are condensed, but all topics are covered including instruction. 5pm – Conclusion, Test Fire. THIRD WEEKEND OF EVERY MONTH!